Remember being a child at the beach holding a pinwheel and watching it whiz around in the seaside breeze? Nothing is more summery than a pinwheel design so we had to show you how to make your own! Better yet, you can use pinwheels for so many different makes! Read Maxine’s tutorial to find out how diverse these pinwheels are and how to use them for home décor and card making projects! 1. Cut a piece of the double sided First Edition Pick n’ Mix 8x8 paper down to a 15cm square. Score a diagonal line from corner to corner across each side of the card. 2. Cut along the score lines to 1cm from the centre. 3. Make a hole with a Fiskars punch in the end of a straw. 4. Use the Fiskars hole punch to punch a hole in one piece at each corner. Make a hole in the centre with a pokey tool. 5. Repeat with a 12x12cm piece of First Edition Pick n’ Mix paper, use a different design to add interest. 6. Take the smallest piece of paper and starting at one corner, put the brad through each hole finishing with the centre. 7. Then thread the larger piece underneath on to the same brad. Place into the straw to secure it. 8. This is how your pinwheel should look at the front. We suggest adding a button to the centre to add a colourful finish! This pinwheel would look wonderful in an upcycled jar, especially if you created a few in different colours! What a fab way of bring a seaside look into your home. You could also use this pinwheel design as a topper for your gift- it will add a fantastic sense of dimension to your present! 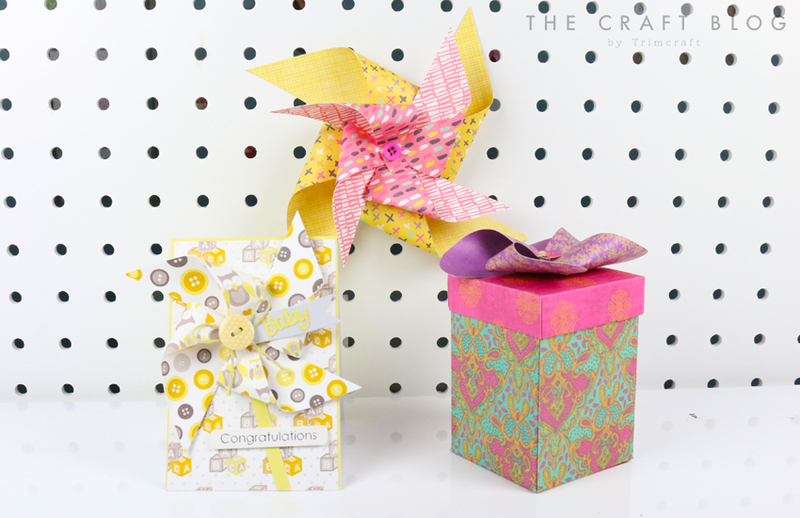 Or if you would like to take your card making to the next level, you could add a pinwheel to your card and embellish it with a thoughtful tag to make your handmade craft even more special! How will you use this paper pinwheel design? We’d love to see so don’t forget to #trimcraft when uploading to social media and to share your makes in the inspiration area! Fantastic projects - can't even say which one I like best!